Responding to the immediate need of traffic signal light reliability, quality, safety and economic issues Spectra Light Laboratories presents the Spectra Candela II model TSL 2000 Traffic Signal Light Tester. It's the only hand held, multifunction, comprehensive, and reliable Light and Light Limiting Diode (II) intensity measurement tester. Specifically manufactured for the traffic industry TSL 2000 can be used for critical signal light applications. 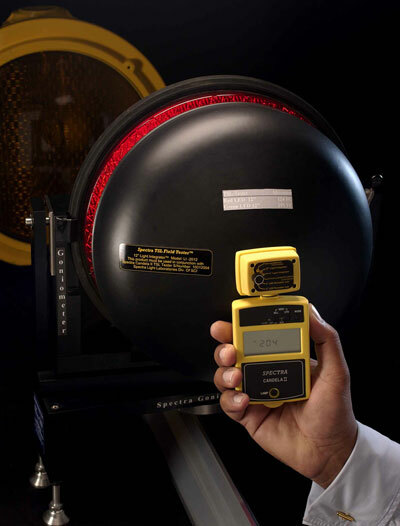 Wide Range extends from 10" to 10"
The Model TSL-2000 system is a versatile, precision, portable Photometer/Radiometer That can be used to measure illuminance, luminance, irradiance, radiance and many other special parameters. This instrument can be custom configured for your application. 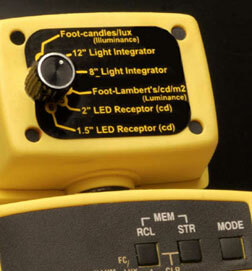 There are up to 12 independent channels available, six channels can be utilized for incident and the other six channels can be used for reflected light measurement. There are 3 factory-configured models available as described on following page. Calibration and indication of the proper readout unit is accomplished automatically when the switches are set and the proper attachment/accessories are installed. NIST-traceable calibration is standard. For highest accuracy and reliability we have carefully selected silicon photovoltaic cell. This detector has broad spectral response and is well suited for all applications, which do not require the extremely high sensitivity of photomultiplier tubes. Calibration for red, green and amber LED is accomplished by providing the correction factor and or adjusting the particular gain accordingly.